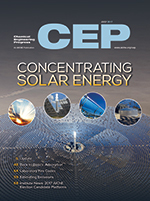 This issue’s special section on energy focuses on concentrating solar thermal (CST) technology. The first article provides an overview of CST and introduces various applications. The second article details the different types of solar thermochemical energy storage (TCES) that could be combined with CST in concentrating solar power (CSP) plants. The final article explains how ammonia synthesis could be used for TCES in a solar receiver that would also function as an ammonia reactor. Other topics in this issue include adsorption basics, laboratory fire codes and estimating emissions. The mission of the Advanced Research Projects Agency-Energy (ARPA-E) is to overcome the long-term and high-risk technological barriers in the development of energy technologies that would enhance the economic and energy security of the U.S. — by reducing imports of energy from foreign sources, reducing energy-related emissions, and improving the energy efficiency of all economic sectors — as well as ensure that the U.S. maintains a technological lead in developing and deploying advanced energy technologies. Recently, I had the opportunity to view a great swath of the U.S. in less than six hours. Flying west from New York to California, I spotted major cities and snow-capped mountain ranges, but what stood out to me the most was an enormous circular arrangement of mirrors all facing one central point. From my aerial vantage, I recognized it as a concentrating solar power (CSP) plant, and later learned it was likely the Crescent Dunes CSP plant in Nevada. Concentrating solar thermal (CST) technology can be used to generate electricity, desalinate water, and more. Find out how CST works and the role chemical engineers can play. Thermochemical energy storage could be the key to widespread concentrating solar power (CSP) deployment. Concentrating solar power (CSP) with energy storage could help meet our zero-emission energy needs. This article explains how the Haber-Bosch process for ammonia synthesis could be used for low-cost energy storage in CSP plants. Adsorption can be used to treat waste streams or purify valuable components of a feed. This article describes both equilibrium and mass-transfer considerations, and reviews the fundamentals of adsorption system design. Laboratory owners are faced with a difficult task when building a new lab or renovating an existing one — two fire-prevention codes specify different restrictions on the quantities of hazardous materials that can be used and stored in that facility.